Question: Almost every day we read news reports from different countries about parents killing their children, children killing parents, wives killing their husbands and husbands – their wives, grandchildren – their grandparents and so on. What is this? Is this one of the expressions of the global crisis? My Answer: It’s the expression of the last stage of egoism at its initial stage. The prophets wrote that there will come a time when “compassionate women will boil and eat their own children” (Eikha 4:10). This is what will happen unless we heed the prophets’ warning and go through these times in a different way, in the Light of Kabbalah that corrects egoism. Question: One way or another, the Creator compels us to develop through suffering. So a person doesn’t develop according to his free will, but out of necessity. But isn’t the Creator’s plan to create someone equal to Him, a partner? What kind of equality is this? My Answer: The entire period of free will and independent development is still ahead of you. However, you can only be brought to it through suffering. Otherwise your egoism will push you to everything but spiritual development. Throughout all previous times, we developed only through the development of our egoism, but now we have been given the opportunity to develop under the influence of the Light. So now you have freedom – freedom of how to develop. Question: “I want to be good to You in order for You to be good to me” – this is a quote from your book in Russian, To Be a Chosen Nation, p. 324. Isn’t this an egoistic intention? Or is it the corrected egoism? My Answer: It is the corrected egoism. However, it isn’t always possible to understand the intention, because the words can only convey one’s desires. In other words: “I ask You to correct me and I will do anything for it.” And “good” means the quality of bestowal and love. Question: Today every one of us egoistically feels like an individual. What will every one of us feel after the correction? Will each of us feel that the Common Kli is him? Answer: Definitely, because this is how we were created: as parts of one whole. Instead of perceiving ourselves, we need to perceive the whole organism. The perception inside oneself is our world, whereas the perception outside oneself is the Upper World. Are Israeli-Americans Beneficial To Israel And Kabbalah? A question I received: You wrote that when the Israelis living in America felt the crisis, they scurried to return home to Israel. But at the St. Louis Congress you said that in order to influence the world, the dissemination of Kabbalah has to come from America because Israel isn’t strong enough to do it. If all the Israeli Americans will return to Israel, then who will disseminate Kabbalah here? As an Israeli, what should I do? Should I return to Israel before it’s too late, or disseminate Kabbalah in America in the English language? My Answer: Israelis living in America have never done anything beneficial for their nation, Israel, or Kabbalah! They have been the most egoistically repulsive tribe in America! And as long as they stay that way, I don’t care where they live. Now they’re returning to Israel so others can take care of them here! They’re still completely unfit to disseminate Kabbalah in America. 13. Similar to how corporeal objects are separated by space, spiritual objects are separated by a difference in qualities. Two people whose views are similar are close, whereas two people whose views are opposite are far. And even if they’re in close physical proximity, they still feel distant from one another. So spiritual objects are close or far from one another only through their qualities: A difference of qualities separates them from one another, while similarity of qualities brings them closer, leading to adhesion. The desire was created by the Creator, and is neither good nor bad. The creature’s state isn’t determined by the desire, but for whose sake the desire is used. The Creator bestows, and therefore when the creature uses the desire “for the sake of bestowal,” it is similar and close to the Creator. On the other hand, a creature that uses the desire “for its own sake” (for the sake of reception), is opposite to the Creator and hence distant from Him. However, one should never forget that the desire to bestow does not exist in nature. There is only the desire to receive (to receive fulfillment, pleasure). However, if this desire is used “for the Creator’s sake,” then it is absolutely equivalent to bestowal. 14. The fourth phase, which feels that it is opposite to the Creator, stops receiving the Light. This action is called Tzimtzum Aleph (the First Restriction). As a result, the desire remains empty. It then decides that it will only receive if this will please the Giver, the Creator. 15. Thus arises a new condition of reception – to receive only for the sake of the Creator. In so doing, the creature attains equivalence of form to the Creator. For example: a person comes to his friend’s house, who offers him to stay for dinner. Naturally, the guest will refuse the food, no matter how hungry he is, because he doesn’t like feeling like a receiver who doesn’t give anything in return (as he would in a restaurant, for instance). However, the host urges and persuades him, saying that the guest will please him greatly by receiving his food. When the guest feels that this is truly so, he agrees to receive the food, because he no longer feels that he is a receiver; on the contrary, he feels that he’s pleasing the host and doing him a favor by agreeing to receive from him. It follows that despite the guest being hungry and unable to receive on account of the shame of receiving, the host’s persuasion and the guest’s refusal gave rise to a new condition: reception turned to bestowal. This happened due to a change in the guest’s intention. The guest receives, but his intention has changed. It is precisely the force of repulsion of the food, and not the feeling of hunger which is the actual desire, that became the basis for receiving the food. 16. We see that instead of using the desire directly, it is used in an “opposite” manner: the pleasure runs into refusal – the Screen, which stands in the Light’s way to the desire. Then the Reflected Light emerges – the desire to receive for the sake of the host. And only to the extent of this intention – the Reflected Light, the Direct Light is allowed to enter the desire. This reception of the Light is called “Zivug de Hakaa” (striking interaction) – first the strike, then the interaction. A question I received: Are we done with this crisis? My Answer: I’m not an economist, but in my opinion, the real crisis is still ahead of us. This opinion is based on real data and the fact that we still haven’t drawn the conclusion that we have to correct ourselves. After all, the reason for the crisis is to awaken us toward correction. For now we’re observing the crisis at the stock market, but it may take another year for it to manifest in the economy. The tsunami wave of the financial crisis has not reached humanity yet. For now all the stock market plunges are mostly assessed by the anticipation of the financial crisis. How will it manifest? There will be a wave of unemployment, wage reduction, the virtual disappearance of high-tech, a drop in real estate prices, growth of inflation, bankruptcies, nationalization of banks, and annulment of investors’ savings. And this will continue until we recognize the reason for this crisis – us! My Comment: Long live the king! He’s right, as long as he’s talking about true cooperation, as befits a small village or a family. This shows that man is starting to change. News Report (from The Telegraph): “Russians turn away from vodka in hard times” With retailers struggling to find credit and ordinary Russians being forced to change their spending, a vast lake of undrunk vodka is accumulating in distilleries across Russia. Official statistics indicate a collapse in demand for vodka over the past two months. November inventories of unsold vodka stock have risen to 82 million liters, a 600 per cent increase from 2007, according to the National Alcohol Association. “People are spending less money on alcohol and other products because of the financial crisis,” said Pavel Shapkin, the executive secretary of the National Alcohol Association. My Comment: Of course, Mr. Shapkin is right. However, people will still find ways to get drunk, such as resorting to the low-grade black market brew, which will harm them even more. Russia’s national question is: how can it find balance between the optimal amount of liquor for everyone, and making it available at a reasonable price, so the people won’t quench their thirst with poisonous substances? A question I received: Where will the crisis be felt the least? My Answer: This question isn’t related to Kabbalah, and I’m not a specialist in economics. However, I think that the crisis will be least harmful for countries with the most developed economies: the US, then Europe, and then Japan. According to Kabbalah, those closet to integration and globalization are better off. The same is true for their currencies. Laitman.com Post: Who Will Be Most Affected by the Economic Crisis? The Lithuanian publishing house “Dialogo Kulturos Institutas” (The Institute of the Culture of Dialogue) has just published a new book in Lithuanian, which is a translation of the English book Basic Concepts in Kabbalah. The book’s publication was made possible by our friends Rimantas and Daina Meshkenas, who work in the publishing industry. The publishing house and the united group of Lithuania are starting an advertising campaign of the book. 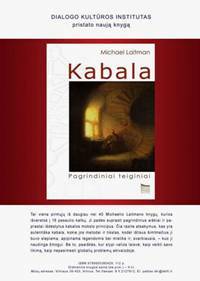 In addition, the book will be presented at Lithuania’s annual book fair in February 2009. Globalization is the revelation of a new level of connection between us. It should be beneficial, but we see that it only brings us more and more problems. Why does this happen? It’s because we are using the global integral system backwards: in order to build ourselves up by bringing others down, instead of learning to work together. We are always trying to defeat, degrade, and be better than others. Instituting a universal education system that teaches people about the law of humanity’s existence in a closed system. Even the first movements we make in this direction will put an end to our opposition to Nature and bring us to harmony with it. Then the crises and suffering will vanish. Actually, the present crisis frees up enough people and forces in order to realize this project. Knowledge about the world we have suddenly found ourselves in will be met by everyone with understanding. The crisis taking place now has prepared us for this. Today we have to be reeducated about how to live in a closed, interconnected system, where “everyone is in one boat,” where the salvation of every person depends on everyone. We have to learn – and teach our children – about the new world.